Bruce Lawson on the technology bringing the web to emerging markets. This is an extract from an interview with net magazine conducted in 2016, while Bruce was deputy CTO at Opera. He is now working at Wix. “Everybody, regardless of their ability or disability and regardless of where they are, has an equal right to say ‘LOL’ at someone’s kitten picture.” So sums up Bruce Lawson’s approach to the web. Lawson and his eye-catching outfits are a regular presence on conference circuits the world over. But hidden behind his goofy sense of humour is a fierce passion for the web and a willingness to fight hard to ensure its benefits reach as many people as possible. 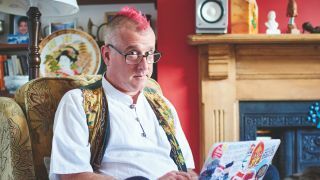 Lawson’s passion for inclusivity has its roots in a personal experience: his first explorations into the web were prompted by a diagnosis with multiple sclerosis. Lawson’s symptoms are luckily relatively mild but in that moment he was very aware that he could be facing something much more debilitating. “For me the ability to find and join a community of people, newly diagnosed with MS, all around the world, for free, was a genuinely revelatory moment,” he recalls. When we chat, he’s recently returned from Israel (where he added two hats from a Tel Aviv production of Evita to his Tumblr ‘What’s Bruce wearing today?’) and is in the middle of topping up the dye job on his pink mohawk, ready to fly to India that evening. It’s clear that foreign travel is still a major part of the role. It might sound draining but for Lawson it’s a way of life. He was born in Yemen and moved to Kenya as a baby, then spent most of his 20s in Asia, backpacking for four years before settling in Bangkok to co-found an English school. The novelty of new places and faces has yet to wear off. All this travel has given Lawson a broader perspective on the web: he’s always known it wasn’t just something for rich people in developed countries. Having introduced many of the features of native apps – geolocation, touch and so on – to the web via APIs, efforts have shifted onto the user experience. Users can now launch a progressive web app from their homescreen, open it up fullscreen, and access its content offline thanks to Service Workers. However, there’s still a long way to go. A definitive solution hasn’t been found yet. Opera is currently working on a labs build in which there’s a gesture a user can employ to pop a PWA out into the browser, from where they can copy and paste a URL. “That might prove the wrong approach, ” he admits. “We don’t know, we’re all experimenting.” Google and Opera are both working on the same umbrella concept, and taking what Lawson calls a “collegiate approach”; sharing information and deliberately exploring different implementations so they can see what works and what doesn’t. Leading the charge for PWAs are India, Indonesia and Africa. Because PWAs live on the web, there’s no need to download loads of information, making them much smaller than their native counterparts. As such, they’re suitable for users on lower-specced devices with limited space and for users in areas where the networks aren’t reliable enough to download big apps. With PWAs there’s also no update distribution lag, which has the potential to have a big impact in developing economies. Lawson uses the example of a developer who finds a major security flaw in their app. They fix the issue and push an update out. For a user in India or Africa, that download might require half their monthly data and for all they know it’s just for a tiny UI change. So they might wait until they get into a coffee shop with free Wi-Fi or they might never update the app. Because PWAs are live, every time a user visits the app they will be served the latest version and there’s no need for data-draining updates at all. Perhaps as a result of this, Lawson has been heavily involved in web standards throughout his career. He’s the man primarily responsible for getting the <picture> element into all browsers this year, after “like half a decade of doggedly pushing for it”. This article was originally published in issue 286 of net, the world's best-selling magazine for web designers and developers. Buy issue 286 or subscribe to net. Want to hear more from Bruce on how to open the web up to the world? If you're interested in learning more about how you can make your sites more accessible to a global audience using new web standards, make sure you've picked up your ticket for Generate London from 19-21 September 2018. Former deputy CTO of Opera and current fashion consultant for Wix, Bruce Lawson will be delivering his workshop – Shokunin of the Web – in which he will explore how you can become a web shokunin, a Japanese term meaning an artisan with a “social obligation to work his/her best for the general welfare of the people."